BRB, ASL, ATM, LOL, TC, W8, etc are just a few examples of the best abbreviations of slang words. I have already shared Facebook abbreviations for chatting and texting. 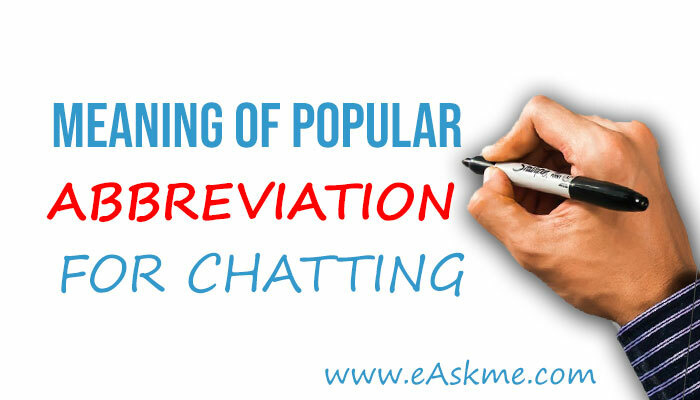 Using abbreviations help you to save time when chatting. Why should you use abbreviations? Using abbreviations will help you save time and easy to chat with multiple people at the same time. It is an easy and quick way to share the words effectively. These days’ people are looking for more and more short words to use and save time. I am sharing some of the most popular short forms or short words that you can use online. Many times when someone type a short message, you will find it hard to understand what he want to say. This list will help you to find the meaning of popular short words and abbreviations. This list will help you find the meaning of BRB, ASl, LOL etc. to make it easy for you to chat with others and understand what others want to say. Do you know any more short words? If yes, do share via comments.